, join us today. In this post, PJ talks about the unlikely story of a small flour company based in Vermont that’s made it big with the help of the web. -Ed. This is the story of a small, regional company that sells… flour. Yes, flour. It’s the story of how King Arthur Flour, a centuries-old company, used the web to grow into an international business, devoted to spreading the pure joy of baking throughout the world. Thanks to the web, it’s a story that will stretch far into the future. Over the next two centuries King Arthur grew, in its own small way. The business gradually moved beyond the Boston area, and sold its flour throughout all of New England (we also moved our HQ to Vermont). In 1990, King Arthur launched The Baker’s Catalogue, a mail-order catalogue selling flour, tools and baking ingredients. Over the next five years, the catalogue helped introduce King Arthur Flour to markets outside of New England. 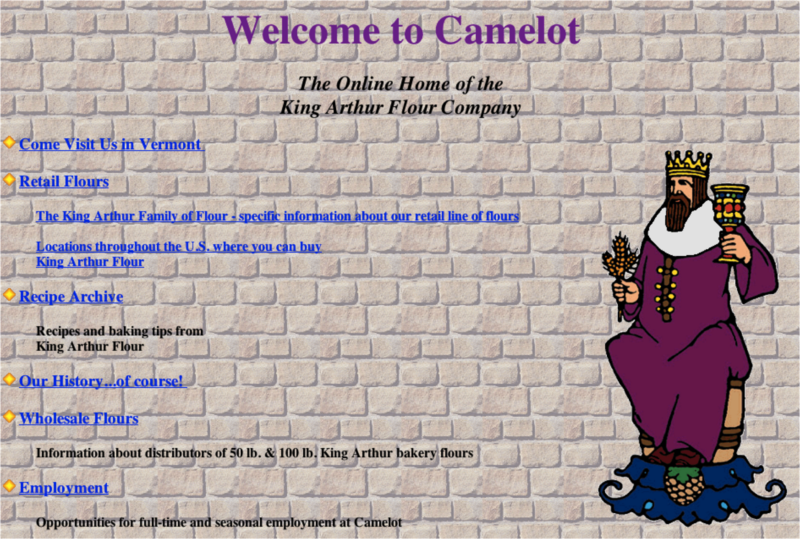 By 1996, King Arthur Flour was selling like hotcakes, with flour in supermarkets across the U.S. The World Wide Web was also growing in reach. That’s when we decided to make another bold move: taking our business online. We could see the power of the web—how it would enable us to reach customers and markets a small company like ours would never have had access to in the past. King Arthur’s first site, in retrospect, was crudely designed and very, very basic. It featured five recipes, information about our flours and a bit of our history. Since then, however, we’ve ramped up our presence on the web—and become tech savvy. Today, we’ve published more than 2,000 recipes online, all tested by bakers in our test kitchen. Over 75 percent of our catalogue sales now come in through our e-commerce site, which we built in 1999. We now connect directly with our customers through our blog, ratings and reviews and the social web. Customers new and old find us via Google search, through both organic search results and targeted ads; we manage 2,000+ baking-related keywords on Google AdWords. Email marketing, and the spread of our recipes and content throughout the web, have established us as a true resource to millions of people who love to bake. In fact, during the peak of the holiday baking season, we receive almost 2 million site visits and 10 million pageviews per month. The energy we’ve put into our online presence has produced tremendous growth for the business. Our workforce has quintupled in size, and we’ve built a huge new warehouse to handle the enormous increase in orders and sales. Brand awareness (and flour sales) have reached new heights across the U.S.; indeed, around the world. And significant growth continues year after year, with no signs of slowing down. King Arthur spent 205 years offline and 16 years (and counting) online. Thanks to the web, this little flour company in Vermont has truly become America’s baking resource. We’re a 221-year-old startup—looking to grow, and loving every minute of it. From time to time we invite guests to post about items of interest and are pleased to have PJ Hamel, web producer for education and community at King Arthur Flour, join us today. In this post, PJ talks about the unlikely story of a small flour company based in Vermont that’s made it big with the help of the web. -Ed.